Contact Luff Industries today to Increase your Conveying Performance TF: 1.888.349.LUFF (5833) E: info@luffindustries.com W: www.luffindustries.com TO IMPROVE YOUR CONVEYING PERFORMANCE IT TAKES GUTS Luff Industries has partnered with SKF to provide its customers with the best components available. 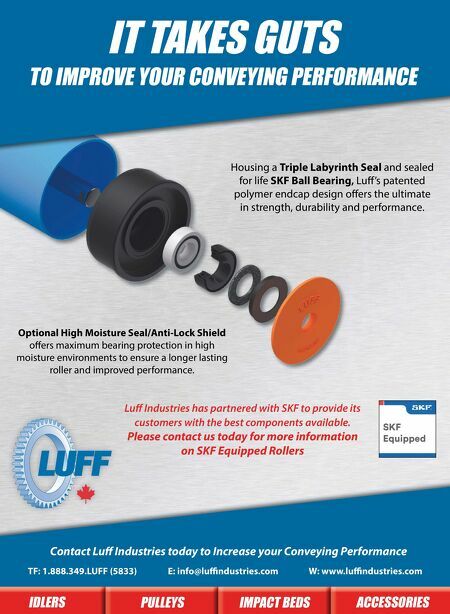 Please contact us today for more information on SKF Equipped Rollers Housing a Triple Labyrinth Seal and sealed for life SKF Ball Bearing, Luff 's patented polymer endcap design offers the ultimate in strength, durability and performance. ACCESSORIES IMPACT BEDS PULLEYS IDLERS Optional High Moisture Seal/Anti-Lock Shield offers maximum bearing protection in high moisture environments to ensure a longer lasting roller and improved performance.